Over the past few months Birmingham has seen several new businesses open their doors all over the downtown area. A handful of those are eateries, but a few of them are one-of-a-kind retailers offering only the finest of goods, services, and clothing. The Local got the chance to sit down with a few of the owners and hear a little about the driving force behind these new ventures. The first is Small Box Co. started by local entrepreneur and architect, Eric Tasker. Located at Railroad Park, the space is unique in its very nature. Eric created a retail space out of a shipping container in an effort to house local startups. The idea is for Small Box to act as a springboard for retail startups in the Birmingham area, allowing new entrepreneurs to test out markets, locations and products before moving into a brick and mortar location. 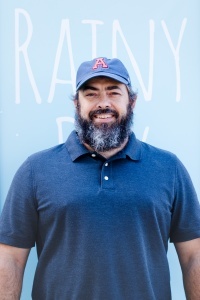 First to fill the box is Rainy Day Studios, a retail collective of southern artists. Eric was kind enough to answer a few of our questions over some Red Cat coffee. A: Small boxes for big ideas. Q: Why this current venture? A:I wanted to create a space to help people achieve their vision. Small Box works as a building block for new retailers to gain customers, build their lines, and work towards acquiring a brick and mortar location in the future. Downtown is growing and as it is growing more retailers need to be brought downtown, Small Box helps these retailers gain the necessary sales and market leads in order to gain enough financing to eventually move into a brick and mortar. Q: Any more boxes in the future? A: I have the one for now; I’m hoping to open a few more located all over town, in effort to allow tenants to test their markets in different districts and neighborhoods. A: I have two kids and my wife and I love to take them biking on the Rotary Trail. Follow Small Box Co. on Instagram: @smallboxco, as well as current tennat: @rainydaybham. 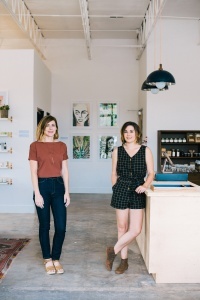 Opened in September 2016, Winslet and Rhys located in Avondale is a one-of-a-kind mercantile shop that was created out of two women’s dreams to provide Birmingham with a store of high quality, handmade goods. Both women spent much of their lives traveling around the world where they grew to appreciate the beauty in simplicity. That lifestyle resonates throughout Winslet and Rhys. The store has an exquisite line of household goods, women and children’s clothing and an array of locally hand crafted letterpress prints. Between checking out customers and stamping letters, Brittany Baker the “Winslet” of the duo answered a few questions for us. Q: What is the story behind the store name? A: General Stores back in the day were generally names after the owner’s surname, and if it was a woman, her maiden name. We loved the idea of using our maiden names as the store name. ‘Winslet’ is me and ‘Rhys’ comes from Mallory’s maiden name Rice. Q: Inspiration for the store? A: Both Mallory and I moved to Birmingham and saw a need for a store curated for woman, so we designed a store we would want to walk into and shop! Q: Favorite items in the store right now? A: Yield Design Co.’s French Press, Hackwith Sweater in Peach and the House Candle. Q: Most amazing place you have traveled? A: Fez, Morocco. It’s Morocco’s hidden secret. Q: Best part about being located in Avondale? A: The neighbors (MAKEbhms.) It’s like having a little family all for each other! Artefact Supply was created out of one man’s void to find a local brick and mortar store where he could buy well crafted men’s apparel. Brandon Hays, a lawyer at Second Row Law, has a passion for any and all well crafted products. 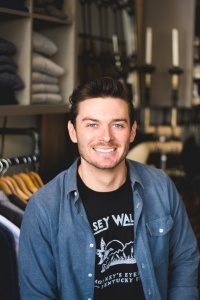 He made it his “passion project” to create the essential men’s apparel shop in downtown Birmingham. Artefact Supply is committed to supplying men with quality timeless apparel and goods, such as denims, chinos, sweaters and button downs. While opening the store, Brandon Hays took sometime to answer a few of our questions. A: I was born and raised in Birmingham. I graduated from Vestavia High School and attended the University of Alabama for my undergraduate. Later I graduated from Cumberland School of Law and opened up Second Row Law firm with a few of my colleagues. Q: Where did you draw inspiration from for your store? A: On a trip to Austin, TX where I stumbled across a men’s store names STAG. Artefact Supply is really a passion project of mine, I’ve always been passionate about well crafted store’s and there wasn’t one available on this side of the mountain, so I opened one. Q: How did you choose the brands you would include? A: I searched for brands who were unique and cultured, but also had a good price point. Just to name a few: Life After Denim, 3Sixteen, Billykirk and Red Wing Heritage. A: 2nd Avenue is the heartbeat of downtown right now. Dining, bars, and retail are filling the area. A great place to gain foot traffic. Q: Favorite place to be in Downtown Birmingham? A: At Urban Standard drinking coffee and eating cupcakes or catching a concert at Iron City or WorkPlay.